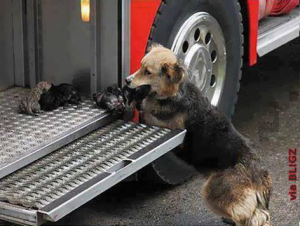 Adorable dogmommy risk her life serveral times to save her little puppies from a fire. Truly admirable and heroic. A new mommy called Amanda place her life in danger again and again to save her puppies from the devouring fire. After rescuing all her babies Amanda sit next to them protecting them with her body. The veterinarian emergency service was called and Amanda and her babies were taken to the hospital, only one of the puppies needed treatment for severe burns. All the family is alive and well thanks to Amanda and her bravery, a truly hero mommy! Never thought in a situation like this an animal could ignore the survival instinct and risk his on life to save the others! BIG BIG “LIKE” for this amazing mommy! It’s well deserved.